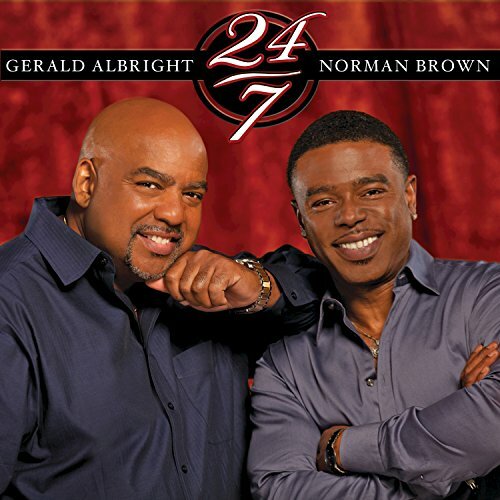 On 24/7, Brown teams up with saxophone master Gerald Albright, whose high-profile recordings have established the Los Angeles-based musician as one of the most prominent artists and a true “musicians’ musician.” Whether he is playing contemporary or straight-ahead jazz, Albright stands in a class all by himself. His 2010 release, Pushing The Envelope, received a GRAMMY® nomination for Best Pop Instrumental Album. 24/7 spotlights Brown on lead and rhythm guitars, alongside Albright on alto, tenor and baritone saxophones, flutes, bass guitar, electric wind instrument, percussion, programming and background vocals. The band for most of the recording alternates between keyboardist Tracy Carter, rhythm guitarist Rick Watford and drummer Jay Williams; and keyboardist Herman Jackson, bassist Byron Miller, drummer Charles Streeter and percussionist Ramon Yslas.